SEOUL (Reuters) - Shares in Hyundai Motor tumbled on Monday on a U.S. probe into why air bags failed to deploy in some of its Sonata sedans, with investors fretting about potential recall costs for the once popular cars. The probe, which follows crashes that reportedly killed four people and left six injured, will review the 2011 Sonata sedan as well as the 2012-2013 Forte made by affiliate Kia Motors Corp, encompassing some 425,000 vehicles. 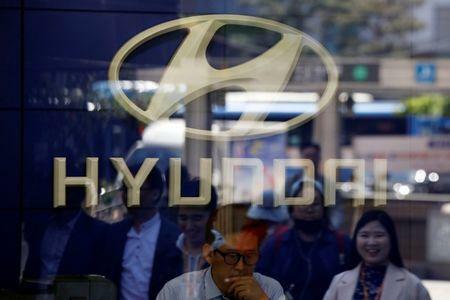 It marks the second investigation by the U.S. National Highway Traffic Safety Administration into the South Korean duo in less than one year, exacerbating headaches for Hyundai which reported in January its worst annual earnings in seven years. Hyundai issued a recall last month for more than 150,000 U.S. Sonatas after incidents of non-deployment were linked to electrical overstress in the air-bag control unit, but said it did not have a final fix. "What I am concerned about is that the recall will be expanded to other markets," said Ko Tae-bong, an analyst at Hi Investment & Securities. The Sonata and Forte sedans were responsible for driving sales for Hyundai and Kia in key markets in recent years, although they are no longer as popular as they once were. Ko estimated the U.S. recall could cost as much as $575 million if air bags were replaced in 425,000 vehicles under review and the automakers were found responsible for the problem. Hyundai Motor shares tumbled 4.8 percent while Kia Motors lost 3.7 percent. Parts supplier Hyundai Mobis fell 5.4 percent while the broader market was down 0.7 percent. Hyundai declined to comment on whether the recall would be expanded. Kia said it has not confirmed problems with the air bags but added it would "act promptly to conduct a safety recall, if it determines that a recall would be appropriate." The automakers told the South Korean regulator that the Sonata and Forte models sold in the domestic market were not affected, an official at South Korea's transport ministry told Reuters. The U.S. regulator said the air bag control units were built by ZF Friedrichshafen-TRW, a German auto supplier that acquired TRW Automotive in 2015, adding that it would determine if any other manufacturers used similar air bag control units and if they posed a safety risk. The NHTSA also said that electrical overstress appeared to be the root cause in the 2016 recall by Fiat Chrysler America of 1.4 million U.S. vehicles for air bag non-deployments in significant frontal crashes. Other problems on Hyundai's plate include profit declines on its delayed response to the burgeoning SUV market and a diplomatic row with China. Its U.S. sales fell 12 percent over January and February, compared with an average industry-wide market that was down 1 percent. Last May, the NHTSA opened a formal investigation into the recall of nearly 1.7 million vehicles by Hyundai and Kia over engine defects. That followed concerns raised by a South Korean whistleblower with the regulator in 2016 that Hyundai had concealed defects and that recalls were not issued in a timely manner.